Experience the world of fabric and discover innovation, function and beauty. The exciting world of fabrics is forever changing with inspirational new ideas that are expanding the vast array of fabrics available for your interior blinds. Enjoy the stimulation of new textures, weaves and colours that are continually being created, making it exciting and fun to choose the perfect style for your decor. Constantly improving technology enables fabrics to be designed to handle diverse environmental conditions. Highly developed production methods enhance the performance and suitability of fabrics for specific applications and blind styles. Innovation and imagination in fabric design are continually increasing the choices available. Whether your blind is a feature or a subtle accent in your decor, there is a fabric that will compliment your lifestyle perfectly. Sunscreen fabrics allow natural light to flow through into your rooms, whilst blocking the direct sunlight and harsh glare. Sunscreen fabrics provide the perfect solution for reducing the heat and cold penetration as well as protecting your furnishings from damaging Ultraviolet sunlight. Sunscreens have an open weave style that allows you to enjoy the view from inside as well as providing you with a comfortable level of daytime privacy. Highly popular as a roller blind, it is often used in conjunction with a block out fabric roller blind to provide day time and night time privacy and sun control. The sunscreen range includes a variety of weaves and textures with a contemporary palette of colours that compliment traditional and modern decor styles. Light filter fabrics allow soft filtered light to enter your room, whilst shading your interiors from harsh sunlight and glare. Choosing a light filter fabric will give you day time privacy as well as a medium level of night time privacy. 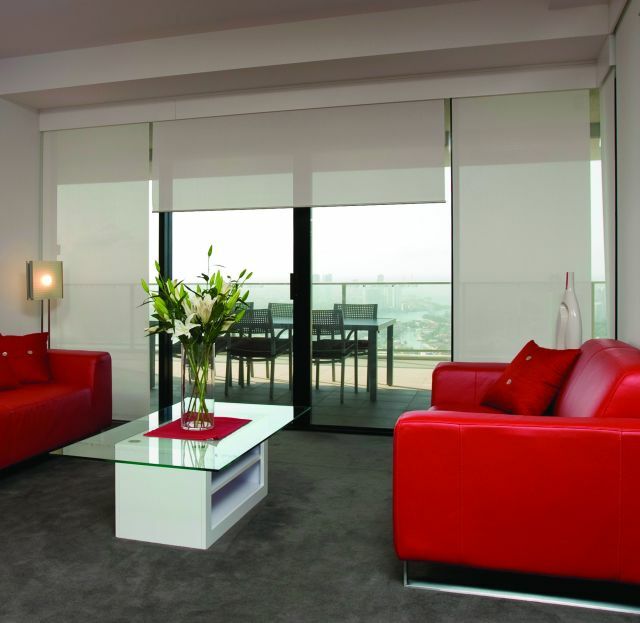 The light filter fabric range includes various styles that give you the option of choosing the level of light and privacy control that will suit your needs. There are many light filter ranges that are also coordinate with a blockout range. This enables you to combine the two fabric types as a double blind option for day and night time privacy and light control. There is a vast range of light filter fabrics that include plain, textured and patterned options, in an array of colours that will enhance your style of decor. Blockout fabrics are the perfect choice for room areas where you require complete light control and a high level of privacy. Using a block out fabric for your blinds will protect your furnishings from damaging Ultraviolet light as well as providing insulation against heat and cold penetrating into the room. The blockout fabric is an ideal choice for theatre rooms, bedrooms and boardrooms where total light control and the ability to darken the room is a priority. The blockout fabric range comes in a vast range of colours, textures and patterns that will sit comfortably into any style of decor.